Here is the end of week 6, beginning of week 7. It was shot on time. I’ve just been delinquent in putting it up. Here is the start of week 6. I wish there was something interesting to say. It looks like the glue on the bottom of the bag is no longer holding on the edge. Does that count as composting? Here is week four’s video. I was confused on the video (all these weeks tend to run together) and said it was the “end of week 3, and the start of week 4.” It is actually the start of week 5. I am deeply sorry for any of the pain this must have caused everyone (said with a sarcastic smile). The holiday weekend kept me from posting this until now, but I took it on Friday, the same day of the week that I’ve generally done all the rest of the videos. I am trying to be strict on this, as it is a very scientific experiment. 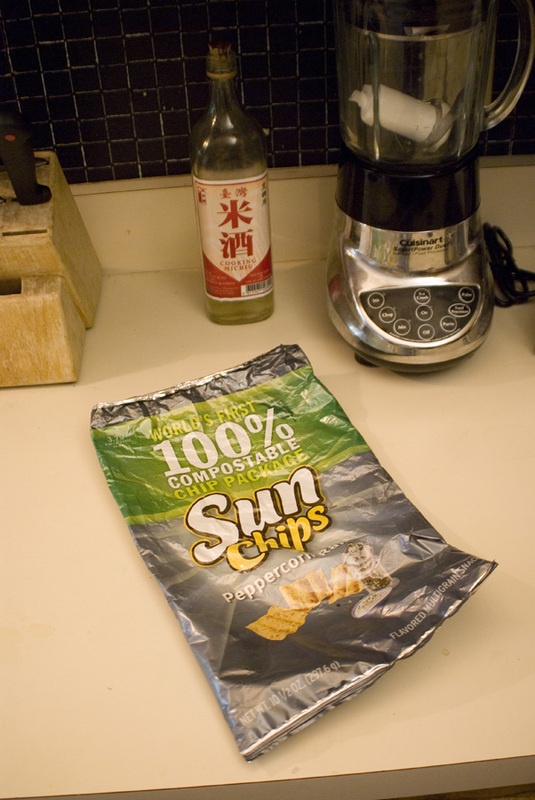 This is the end of week 2 (the start of week 3) of my little experiment with the compostable Sun Chips bag. As the video shows, there doesn’t appear to be any significant signs of composting at all, up to this point. However, when I reviewed the time-lapse video that Sun Chips put on the web, there aren’t any significant signs of composting until the end of week 3. So for our little green bag, this is an important week. We are praying for you to have a serious breakdown this week, little bag. Here’s the video from this week. 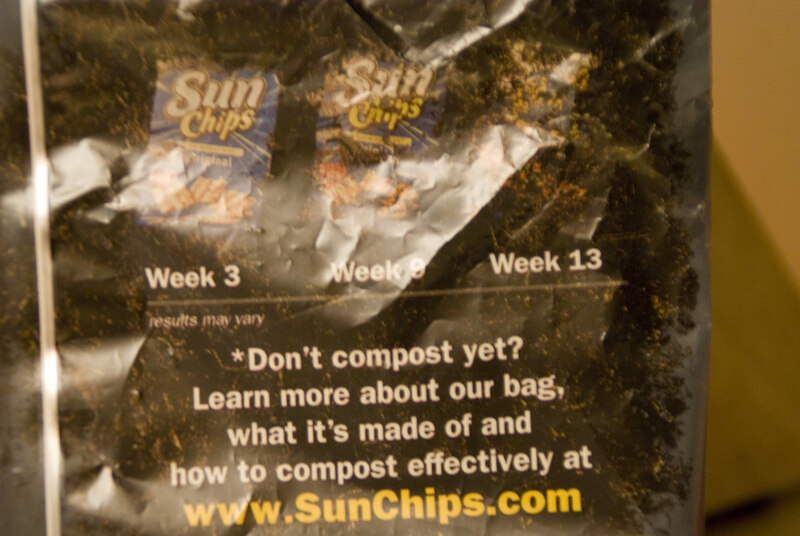 This is the start of week 2 of my Sun Chips compostable green bag experiment. On the back of the bag it advertises that the bag will fully compost in 12 weeks. I am going to test that out. At the end of week 1, after 7 full days, I noticed no deterioration whatsoever. This does not mean that it won’t happen. It just means that there are no visible signs so far. For those of you who are skeptically minded, I have placed an active compost mix both above and below the bag. This compost mix is a mix of full composted material, uncomposted organic material, and everything in between. The compost is in various states of breakdown and some of it has been composting for 6 months. The box is placed outside in the elements where it is affected by both rain and sun. Here is the video of what I found after 7 days. In all seriousness, I love the idea of eco-friendly bags. There is no reason that everything known to man needs to be wrapped in plastic. If you really think about it, half of our landfills are filled not with things that are broken and don’t work anymore, but the packaging for all of our new stuff. So, I enthusiastically support Sun Chips in their effort. In case you aren’t aware of exactly what I’m talking about, here is a crash course from the Sun Chips people, themselves. So, being the really scientific guy I am, I decided to conduct my own experiment. I have my own compost bin at home. So, gathered up some of the compost, and put it in a plastic tub. I’ll be checking back with the bag each week, and showing updates. We’ll see if the bag is really gone in 12-14 weeks, as they claim. Here are pictures of the bag, and a short video showing the start of week 1. Here is the video of me setting up the experiment.